I am lucky enough to have taken Marine Biology this year in school. It is amazing how studying about a new subject opens up your view of things that you thought you knew a lot about. The starfish is one of those things for me. Living on the West coast, I’ve seen many starfish on the beach over the years. After learning more about them, I now find them even more fascinating. I hope you enjoy learning more about them too. Starfish, or sea stars, are echinoderms that belong to the Asteriodae class. A starfish has no scales, fins, or gills like other fish have to acquire oxygen from the water. It also does not swim, but walks! For this reason, even though it has ‘fish’ in its name, marine biology does not consider it a fish. There are around 1,800 starfish species worldwide, and most of them are found in the Pacific, Atlantic, Southern, Arctic, and Indian Oceans. They are found in many different depths of water. Their habitats include mud and sand, kelp forests, seagrass meadows, tropical coral reefs, gravel, shell brash, and the deep-sea floor. 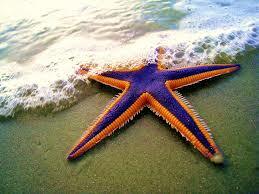 Within the marine animal category, starfish are the most common. Some of the characteristics of marine animals include feeding on mussels and regeneration. Yes, I said regeneration! Some species of starfish can grow back an arm if it gets torn off. Sometimes an entire new starfish can grow back from even the lost arm because most of the starfish’s vital organs are stored in its arms. This is why I thought learning about the starfish would be good in our “A Glance into the Future” issue because some day it would be nice to learn from the starfish to regenerate parts of the human body that have been lost. When we say starfish, we immediately have an image that pops into our mind. There are many different types, however. They come in many different sizes and colors. The length of the starfish measures around 20 to 30 cm (8 to 12 inches) while some species are only 1 cm (0.4 inch) long, and others are as much as 65 cm (25 inches). Starfish have five arms and rays that spread out from a central disc. 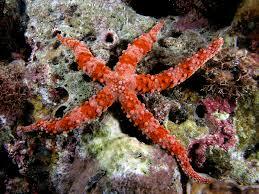 Nonetheless, numerous starfish species have more than six arms. There are a few species that exhibit 10 – 15 arms, with the maximum up to 50. People think that starfish have bilateral symmetry, but bilateral symmetry (looking alike on both sides if folded in half) exists only in their larval phase. How do they move if they have no fins or gills? 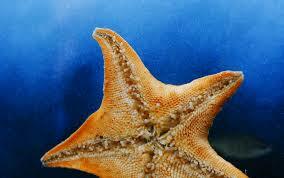 Starfish have a hydraulic water vascular system that helps them move. That means they don’t have one drop of blood in their system! They have several projections in this system that is known as ventral faces and tube feet which help them move and eat. If you turn one on its back, you can see as many as 15,000 tube feet attached to its arms. These feet end in suction pads which are attached to a surface to climb or crawl on. It uses its tube feet and other tubes present throughout its body to breathe in air. There is a small eye attached to the end of each ray or arm of starfish which allows it to discern between darkness and light. The starfish mouth is located at the base of its body where it is attached to a short esophagus that goes into two types of stomachs. Starfish can eat prey that is larger than its mouth because it can digest food outside of its body. What? That’s right – outside of its body. The starfish has two stomachs. The cardiac stomach can help the starfish engulf food outside its body. When the cardiac stomach comes back into the body, the food in it is transferred to the pyloric stomach. It can eat small fish, snails, mollusks, clams, and oysters. Some starfish also eat algae, but they are mostly grazers. If you pick up a live starfish, you must be careful because they are receptive to light, touch, orientation, and temperature. The spines, tube feet, and pedicellariae are responsive to touch, while eyespots on the ends of the rays are light-sensitive. Global warming and pollution of the sea water is threatening the habitat of these marine creatures. Just like the corals, these fantastic sea animals are losing the battle of survival. Please respect them by not polluting their habitats and watching, not touching them, when found so future generations can enjoy them as well.